Continental Flooring specializes in the installation and refinishing of hardwood floors. We are also one of the few local flooring companies with expertise in advanced inlay and boarder design. An installation style generally used with ¾ inch solid products. 2″ nailing cleats are used with a wood flooring nailer and mallet to attach the flooring to the subfloor. (If floor is less than ¾ inch, there are different way to install thinner flooring). Solid strip floors or plank floors can only be installed on wooden subfloors that are on grade or above grade. Solid wood strip floors and solid wood plank floors can only be nailed or stapled. The staple-down installation procedure is easier to do than the nail down for do-it-yourself installations. 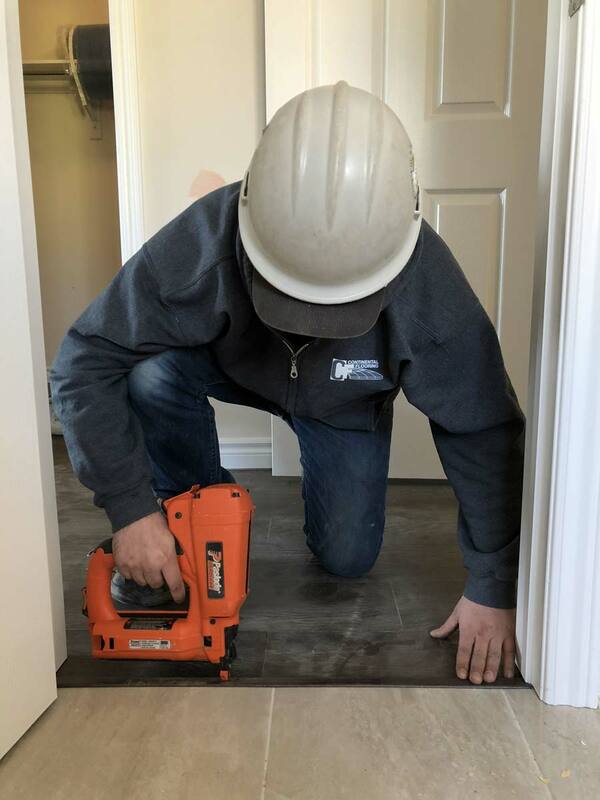 A pneumatic staple gun is used to drive staples through the tongue of the wood planks and into the wood subfloor underneath. Staples are used instead of nailing cleats to secure the hardwood flooring to the wood subfloor. Glue-down installation of engineered hardwood floors can be done over wood type subfloors and concrete slabs. Wood planks are simply glued directly onto the subfloor. The recommended adhesive is spread onto the subfloor using a proper sized trowel and then the planks are set into the adhesive. Some engineered hardwood floors offer a glueless locking system. These floors are meant to float on a variety of sub floors such as wood, concrete slabs, and even some types of existing floors. With the floating installation method, the floor is not mechanically fastened to any part of the subfloor. There is a thin pad that is placed between the wood flooring and the subfloor. Wood glue is applied in the tongue and groove of each plank to hold the planks together. This is a very fast, easy, and clean method of installation.